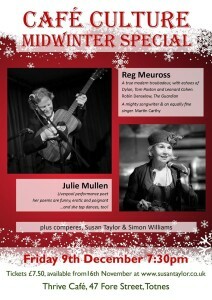 Reg Meuross will be headlining this Friday night is poetry and music night in the heart of Totnes. Susan Taylor and Simon Williams introduce a talented and entertaining band of poets, singer songwriters and storytellers into their cultural corner at the charming Moroccan themed health bistro, which is Thrive Cafe. This is an all organic event – the programme continues to grow organically out of the amazingly diverse range of performers in the Totnes, Dartington and South Devon scene.